The answer: This discovery is a “crucial step” toward finding extraterrestrial life in the universe, according to Amaury Triaud, an astronomer at the University of Cambridge. And even if this exciting new discovery turns out to be yet another disappointing dead end in that search, it has sweeping implications for the future of science. 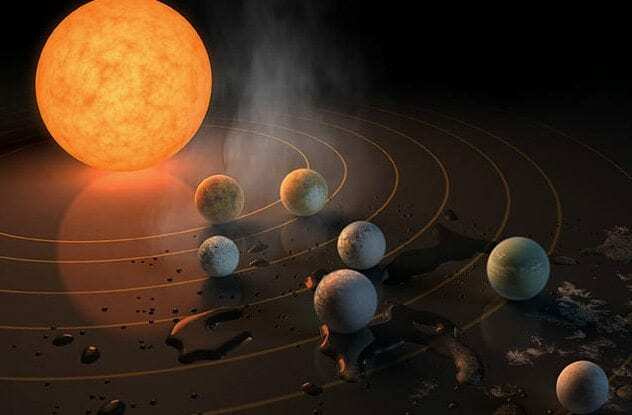 Scientists have already confirmed that at least two of the planets orbiting TRAPPIST-1 (whose size, for the sake of comparison, would be that of golf ball if our Sun were the size of a basketball) are not completely enveloped in layers of thick hydrogen—so they likely have a rocky terrain, much like Earth. Although this does not necessarily ring as the most intrinsically exciting news, this helps rule out the possibility that these planets are simply giant balls of gas, which of course would render them incapable of hosting life. 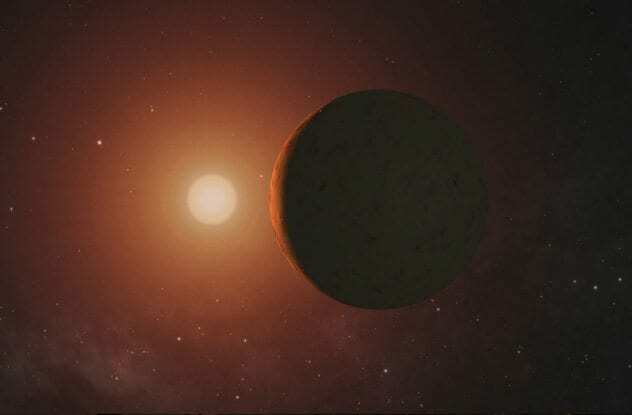 Gas planets are commonly found orbiting stars of this size, and the seven planets being exceptions to a common rule leads scientists to believe there may be far more habitable planets than initially predicted. It takes a special mixture of specific variables for a planet to be potentially hospitable to life. Not too hot, not too cold. Not too gaseous, not too solid. There must be a relatively rocky landscape, lots of light, an atmosphere of ideal thickness conducive to a temperate climate, and water that can be collected in lakes, seas, or oceans. The presence of ozone (which can be a by-product of oxygen produced by photosynthetic plants) in the atmosphere provides an invaluable layer of protection against the damaging effects of the Sun’s ultraviolet (UV) radiation. Scientists are confident that they will find a combination of ozone and methane in the atmosphere of at least three of the newly discovered planets—making them hospitable to life. 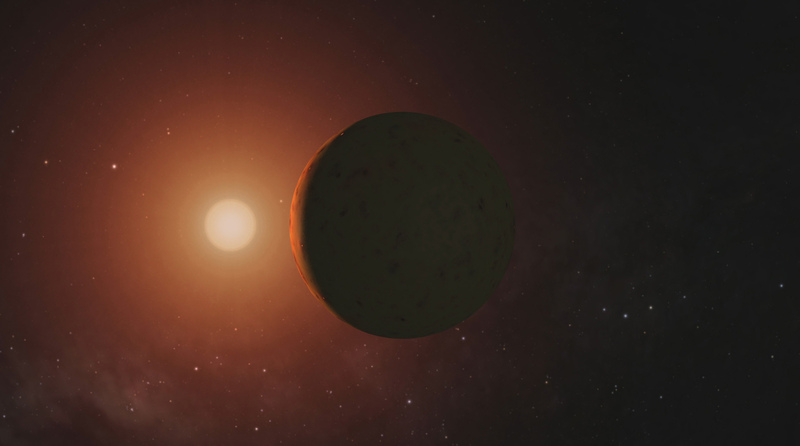 TRAPPIST-1 is classified as an “M-dwarf” star. These stars are extremely common in the universe and tend to be relatively small and dim. TRAPPIST-1 has also been further classified as an “ultra cool” M-Dwarf star, so it is the coldest a star can possibly be. M-dwarfs are notorious for burning their nuclear fuel relatively slowly compared to hotter, brighter stars such as our Sun—so they can shed light on their orbiting planets for incredibly long periods of time, even trillions of years. The discovery is already a major win for science, since even if the planets turn out to be inhospitable to life, this discovery will without a doubt provide scientists with an ideal scenario for testing a wide range of hypotheses. Since these planets are thought to have formed from the same protoplanetary disk (a rotating disk of dense gas and dust surrounding a newly formed star), scientists are confident that the slight but crucial differences in chemical composition and atmosphere of each planet will provide essential insights into the planets’ histories and evolutions. This information can then in turn be used to better analyze the evolutions of other planets, increasing our knowledge of the universe as a whole. This newfound system will also likely be used as a valuable model from which to extract data that can help us gain a deeper understanding of planets and galaxies much farther away, especially when it comes to the search for life. 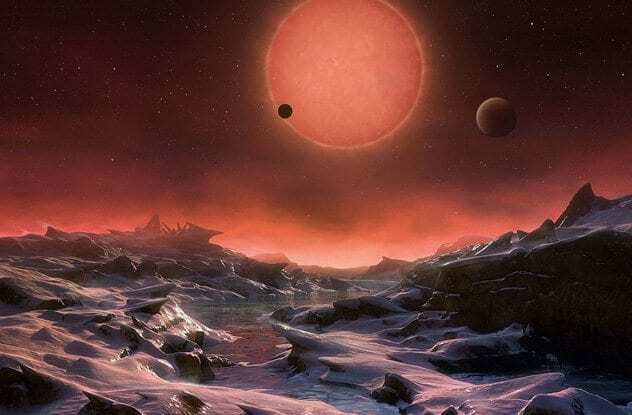 TRAPPIST-1 is where scientists will test their “hopes and desires and fears about planets orbiting these very cold, very low-mass M dwarf stars,” says Sara Seager, a planetary theorist at MIT. In a best-case scenario, scientists will find foolproof and indisputable signs of life. 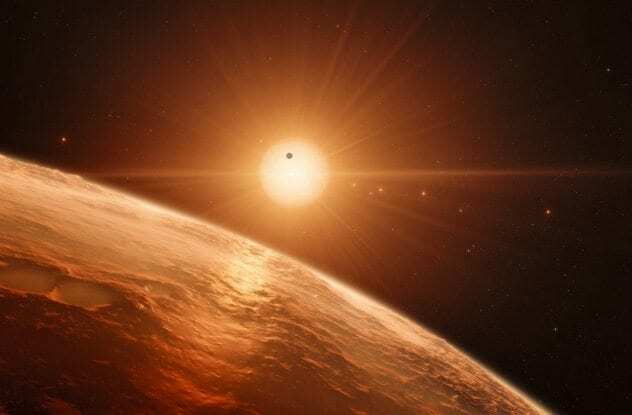 A worst-case scenario, however, is still pretty good: It is possible that scientists may not be able to determine if oxygen found on one of TRAPPIST-1’s seven planets is being produced or consumed by a life form or not. That’s still pretty great news, Seager assures us, the only downside being that it will take more time to investigate the source. Although scientists have long assumed that plenty of Earth-sized planets exist in the universe, until the discovery of the TRAPPIST-1 system, these unique planets were thought to be few and far between. Now, given that the TRAPPIST-1 system has been discovered so close to our own, simple laws of probability imply that there are more such systems than previously imagined. There are likely more M-dwarf stars with similar qualities in the universe than previously calculated as well. This means we have more chances of finding extraterrestrial life, and scientists who have been searching for radio signals generated by alien life forms may have been looking in the wrong places all along. 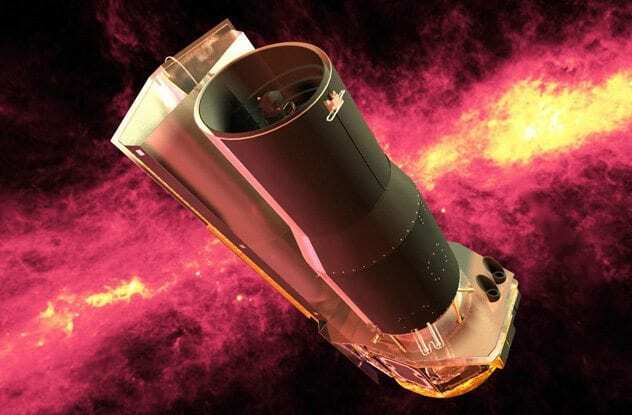 While most of the credit for this discovery should indeed go to the men and women who have been wrestling with this project for months, some credit must be given to the incredibly powerful and awesome Spitzer Space Telescope (SST), which made the discovery possible. Launched in 2003, this infrared space telescope has been capturing and transmitting some of the most fascinating mysteries in space for the past 14 years while traveling in a heliocentric orbit. Armed with an Infrared Array Camera, an Infrared Spectrograph, and a Multiband Imaging Photometer, the SST can capture awe-inspiring images in vivid detail, including, in one of its more famous captures, light emitted from exoplanets—making it the first time extrasolar planets had ever been visually seen. Each planet in the TRAPPIST-1 system was able to be detected due to small dips in TRAPPIST-1’s light. These dips, which occurred every time one of the planets crossed between the face of the star and SST’s giant lens, were transmitted back to NASA, where they were analyzed to estimate the size and mass of each planet. The universe, in all its expansive glory, doubtlessly contains countless planets that resemble those found orbiting TRAPPIST-1. However, it is exceedingly rare that we come across such planets so close to us. 40 light-years is nothing to scoff at. Using modern technology, it would take roughly 44 million years to travel the 235-trillion-mile distance from Earth. 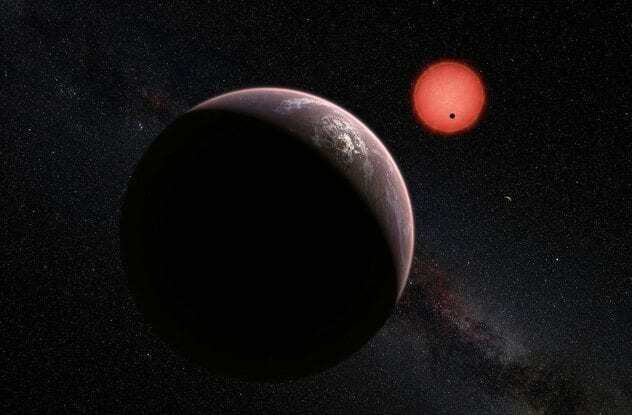 In cosmic terms, however, 40 light-years away is relatively close—so scientists will be able to form conclusions about our own solar system, as well as planetary systems that are far more difficult to “see,” based on data obtained from the TRAPPIST-1 system. 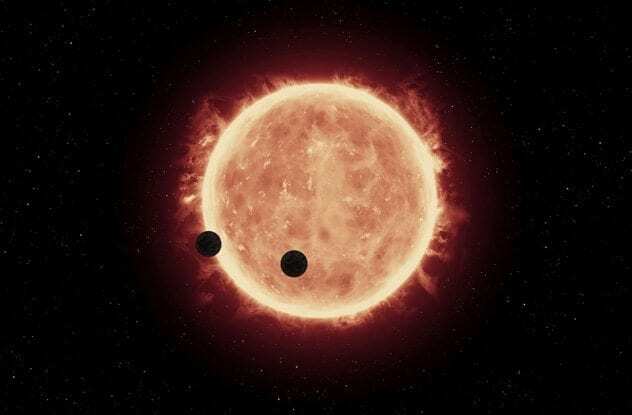 Ideally, the proximity of the TRAPPIST-1 system to Earth will let scientists better understand how dwarf planets, asteroids, satellites, comets, and circumstellar disks form and interact with one another. Much in the same way this discovery will help us better understand other plants in the universe, it will also likely help us better understand their atmospheres as well. It is important to remember that these are the first Earth-size planets that have been discovered orbiting this particular type of star at “just the right” distance. This means that their atmospheres will provide us with crucial information about those of other similar planets, which in turn will allow us to better analyze the chemical “fingerprints” left behind by water, methane, oxygen, ozone, and other components of a planet’s atmosphere. 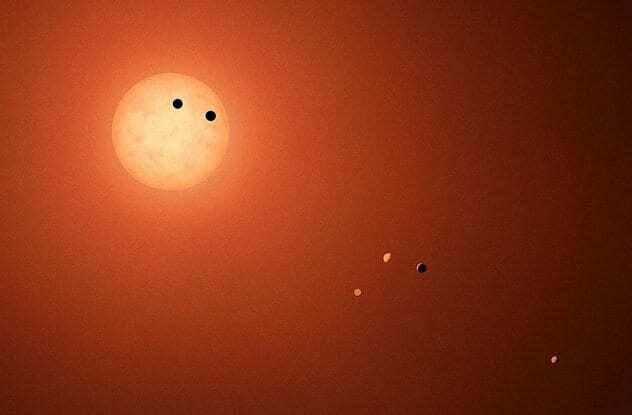 Indeed, the TRAPPIST-1 system provides “one of the best opportunities in the next decade to study the atmospheres around Earth-size planets,” says Nikole Lewis, an astronomer at the Space Telescope Science Institute in Baltimore, Maryland. 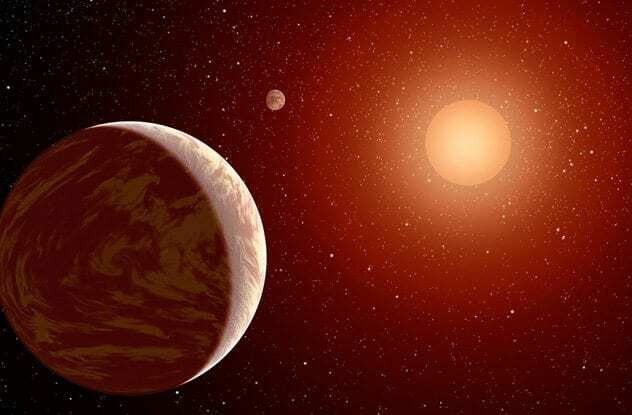 Scientists will also be looking at the temperatures and surface pressures of the planets, which are essential in determining if they habitable or not. In their quest to find signs of extraterrestrial life forms on distant planets or rocks, scientists almost always begin with a simple test: Is there, or could there be liquid water present? And while some planets such as Mars and Venus are thought to have once been home to liquid water, a lack of ozone along with other protective elements lead most scientists to believe that any potential life that would have formed has been dead for quite some time—unable to survive the solar and cosmic radiation that has been pummeling the planet surface unimpeded. 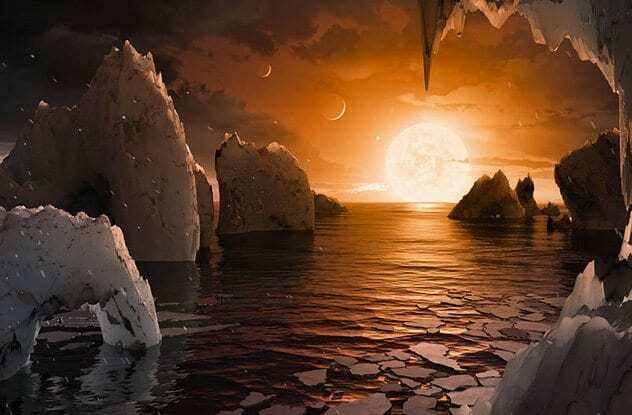 Although it is possible that liquid water could be found on all seven of the planets in the TRAPPIST-1 system, the chances of finding water (and subsequently life) is highest with the three planets that reside within the “habitable zone“—between where it would be too hot or too cold for liquid water to form and pool into lakes, rivers, or oceans.